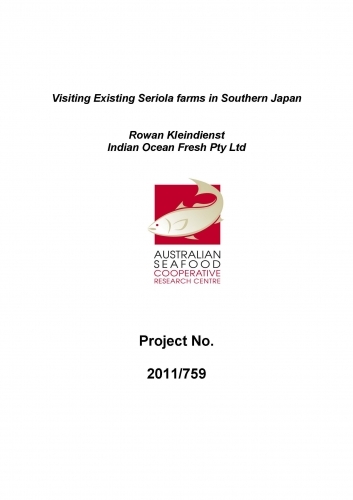 As a newly emerging Yellowtail Kingfish (Seriola lalandi) producer in WA, it would benefit staff members of Indian Ocean Fresh Australia to view much larger scale Yellowtail farms and understand how they are managed and how operations are conducted. This project allowed Indian Ocean Fresh Pty Ltd staff members to visit a Seriola sp seacage operation in Southern Japan. Japanese amberjack (Seriola quinqueradiata), Hiramasa (Seriola lalandi) and Kampachi (Seriola dumerili) farming has developed successfully over the last 30 years on a commercial scale in Japan and there are likely to be similarities in production issues especially in light of similar water temperatures in southern Japan and WA.